The total crypto market cap reached $132BN, Filecoin ICO raised $200m in 60mn and crypto helped Nvidia beat its own guidance for the most recent quarter. Even CNBC Africa launched a new program called Crypto Trader. What happened over the last few months? I have no idea if we are in a bubble but lots of money is going into the crypto space; companies who could not raise VC money and sometimes without a working product are launching Initial Coin Offering (ICO) and even the SEC has released an investor bulletin about ICO including some key points to consider when determining whether to participate in an ICO. I guess the market is hot. Even coinmarketcap has more reads than the WSJ. Coinmarketcap is now ranked higher than WSJ on Alexa. Go crypto! Last spring saw a surge in the price of the Bitcoin and Ethereum, driven by geopolitical and economic reasons including, among others, Trump’s presidency, rising debt levels and new crypto friendly regulations in China and Japan. The price increase led many early Bitcoin and Ether investors to suddenly have a large war chest composed of mainly Bitcoin and Ether, worth from a few hundreds to a few millions of dollars. Most of the early adopters decided to embrace a classic early stage investment strategy named “Spray and Pray”, investing in as many ICOs as possible in order to gain exposure to at least a few successful ones which would return their total investment. Such a strategy does not require investors to perform in-depth due diligence (which is good because it is really hard to assess a pre-product, pre-team and sometimes pre-whitepaper company). Here it is a numbers game. For this reason, many companies who struggled in the past to raise VC funding turned to ICO as they could easilyraise a few millions dollars. At the same time, the mainstream public started to hear about stories of people becoming millionaires by investing in crypto (some even wrote a book) and companies raising millions with only a website and whitepaper written in LaTex. The influx of Retail investors and HNWIs wanting not to miss their chance to become a UHNWI has pushed the total crypto total market cap to a new high. Results? $1.7bn and counting raised from ICOs and a $130bn+ Crypto market cap. Crap. I should have listened to my Bitcoin enthusiast cousin in 2013. Well some people see an opportunity as classic institutional investors are not yet equipped to invest in crypto currencies. At the same time, HNWI, family offices, private banks and others are looking to gain exposure to this new asset class. Just in case… you know… it becomes huge. Hence, anyone wishing to be in the crypto space has two options. Either start their own crypto fund, or start a company and do an ICO as soon as possible. The rest of the post will cover the first option, crypto funds. 1- Pre-Trade. Execution. Post-Trade. Regulation. This is for all my banker and PE/VCs friends who think it is easy to setup a crypto fund. It is not. Pre-Trade. Execution. Post-Trade. Regulation. Say What? As TwoBitIdiot highlights in his post Losing Alpha: Why Most New Crypto Funds Are a Sh*t Deal, it is fairly easy to see the main arguments that crypto hedge fund wannabes use in their pitch. The crypto market is large and growing extremely quickly, but not without regulation, compliance and custody processes. As the market is not yet fully regulated anyone can use insider information (not sure I would recommend that one, though). Howeover, as the crypto market remains opaque for most people, there is an opportunity for savvy Bitcointalk readers to monetise their knowledge. Pre-Trade: Goodbye Bloomberg. Hello Reddit. Pre-trade refers broadly describes the analysis leading to the selection of a specific token / crypto currencies. First you need to build an investment thesis. For example, MetaStable is investing into digital currencies like Bitcoin, Monero etc. Not ICO / Token per se. They have written an awesome blog posts about it. Great, you have a thesis. Good for you. Next step, how do you select companies / currencies / tokens? Here you don’t have Bloomberg, no investor relation page (yet), only a few sell-side research house (The Goldman Sachs of crypto: Smith+Crown). One needs to gather intel from slack channels (e.g. Coinfund), listen to specialised podcasts (E.g. EpiCenter), follow niche news websites (e.g. Coindesk), read on forum like Reddit. Once you have done that you need to build relationships with the team. 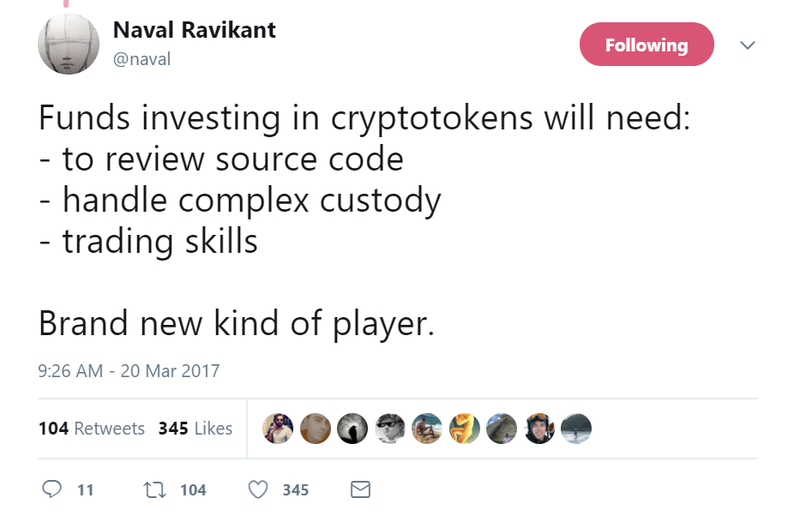 For example have you been to the last Token Summit or Devcon2? Let’s say you have a team of research analysts with a good understanding of the Blockchain. You nailed it. Great, but do you have data scientists with blockchain background? That is hard to find. Even Polychain is looking for one. Imagine you find one. He / She would need to build connectivity with different exchanges to gather historical / live data (or use Kaiko or Coinigy) to be able to perform quantitative analysis. In addition, to quant and fundamental research analysts you also need to have people with deep cryptography expertise. Finding talents who understand what is an ERC20 token and what impact the Plasma project may have on Ethereum is not easy. Even less easy when people with such knowledge could most likely do an ICO and raise millions. Execution. I still miss Bloomberg. Where is my broker? Execution differs if you are investing pre-ICO or post-ICO. The first is quite straight forward. A company asks you to transfer either BTC, ETH or LTC to a certain address and in exchange you will receive a certain number of tokens post-ICO. Recent ICOs use Coinlist to make things even easier and regulated. They often happen with a discount of 10 to 80%. This is great but you need to have access to these deals. As TwoBitIdiot explained, the Polychain and BlueYard Capital of the world will be in this deal. Not you. Game over. Some other questions to keep in mind: What is your risk management? How do you deal with pumps and dumps? Are there good enough measures of VaR etc. for those markets? Very different than investing in private securities, right? Or when you bought Apple shares on Charles Schwab, right? Post-trade. Where is my custodian? Cold or hot wallet? You bought your Bitcoin or other coins / tokens. What do you do with it? JPMorgan Chase does not provide token custody. Would you let $10m+ worth of coins sit in your ledger wallet? What is an air-gapped computer and is it really safe (apparently not)? Do you store your coins at your offices? Do you use Xapo as a custodian? What if you need to do a “quick” trade and you need to have some coins stored on exchanges? Is that ok? Regulation. The major systemic risk. The recent judgement on the DAO case was not a surprise for anyone involved in the crypto land. What was surprising was the detailed level of understanding of the SEC. Read the DAO report of investigation. It is super well written and comprehensive. From my view the main takeaway is that the SEC understands the ICO market quite well and there is a high chance that new regulations will come in the next 12 months. Some exchanges may have to stop trading certain tokens and will need to perform serious KYC checks. A good example is the recent news from Bitfinex (Suspension of U.S. Individual Verification Requests and Bitfinex will be barring U.S. customers from trading ERC20 tokens issued through “ICOs). You get the point. Pre-trade, Execution and Post-trade is not straightforward. It is not rocket science but you need proper resources, an acute awareness of the evolving regulatory situation and of course, some blockchain knowledge. Summary of the questions for each stage that one needs to think about for their crypto fund. If you like my post don’t forget to forward it, recommend it, add comments and share it with your friends.